If you need a better garage, you can rely on Custom Garage Works! We have been providing a variety of custom garage services such as garage floor coating in Wylie, TX since we originally started in 2003. We needed to create the perfect garage, and when we could not find what we needed in the industry, we made the decision to create it ourselves. Today, we provide some of the best garage storage cabinets in the business, as well as top quality polyurea polyaspartic floor coatings that last years longer than traditional epoxy floor coating. We are dedicated to excellence, and we love providing premium garage floor coating and custom garage solutions throughout the DFW area. 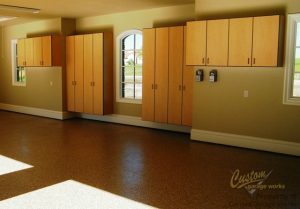 Our custom garage floor coating in Wylie, TX is one of our most popular garage services! This is because by using polyaspartic coatings instead of epoxy, we create a finish that lasts longer and is more durable. Unlike epoxy that will yellow in the sun, and peel or fall off over time, these coatings are stronger and more resilient. In addition to our floor preparation, which incorporates professional diamond grinding, as opposed to acid etching, the end result is a showroom quality floor that is simple to clean, and practically indestructible. If you are interested in hearing more about our garage floor coating service, please schedule your free estimate when you call 214-494-9068 or 817-308-1305. Garage Floor Grinding Our method of diamond grinding is a more effective method of prepping your garage floor for coating. Epoxy Coatings Epoxy coatings are not the best choice for coating your garage floor, but they are generally inexpensive. Polyurea Polyaspartic Coatings Thanks to their incredible durability, these floor coatings are the premiere choice for your garage floor coating. And More! You can learn more about the garage floor services we provide here! If you are running out of space in your garage, Custom Garage Works has the perfect garage storage and organization solution for you! 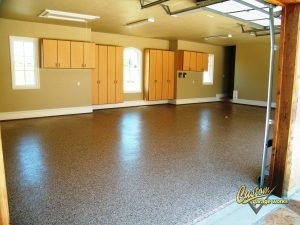 We know your new garage floor coating looks better when it isn’t covered by clutter! With products such as garage cabinets and overhead storage racks, we have a variety of solutions for our clients’ garage organization needs. All of our garage cabinets are secured to the wall for additional safety, and our overhead storage racks are stronger and more reliable than many others you will find on the market. If you need a reliable garage floor coating in Wylie, TX, and unmatched organization solutions, you can depend on Custom Garage Works. Overhead Storage Racks When you need to get more from your overhead storage space, our overhead racks provide safe and dependable storage. Storage Cabinets Unlike kitchen cabinets, these are designed specifically to help you get more from your garage space! Car Lifts A residential garage auto lift is easier to operate than you might think! And More! Don’t be worried by clutter in your garage any longer. We have the organization products you need!